"This is just an old-fashioned tuna egg sandwich that is simple and quick to make! My grandparents make these and tell me that this is the 'correct' way to make a hearty sandwich!" 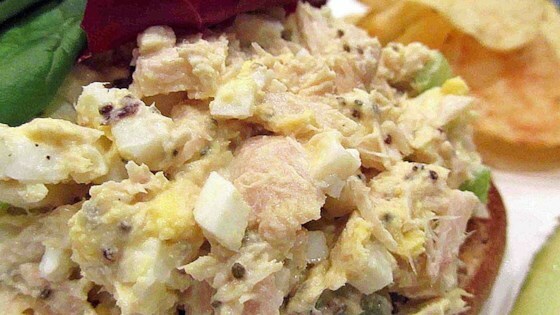 In a medium bowl, stir together the tuna, eggs, celery and mayonnaise. Season with salt and pepper to taste. Place half of the mixture onto 1 slice of bread and the other half on another slice of bread. Top with remaining slices of bread. Serve. See how to make a bacon and egg sandwich with a French toast twist. Im pregnant, and I crave tuna, this recipe is delicious, you have to put eggs in or it just isn't the same. I also added some sweet relish to this and gives it more flavor. These are great, but you gotta add some onion! This very much like the one I've used for years. I use 2 egge and 2 Tablespoon chopped black olives. The green stuffed ones are good too. I didn't have any celery, and I used 4 eggs instead of 3. It was great for school lunch! I would have never thought of using tuna mixed with egg!